A son of the Corps, RJ is a 2nd generation Marine and third generation officer, who grew up in multiple locales but calls Stafford, Virginia home. In 2011 RJ graduated from Virginia Tech with a B.A. in History and a B.S. in Geosciences. After graduation, he enlisted in the Marine Corps Infantry deploying in support of Special Purpose MAGTF Crisis Response to Tripoli, Libya in 2013 and participated in a Unit Deployment Program in 2014. In 2015, RJ commissioned in the Marine Corps Reserve as a Supply Officer and is currently serving as Executive Officer of Detachment 2, Supply Company, CLB 451. After leaving active duty, RJ worked as a contractor for the United States Coast Guard providing logistics analysis and support for the Heavy Polar Ice Breaker Acquisition program under CG 9326. 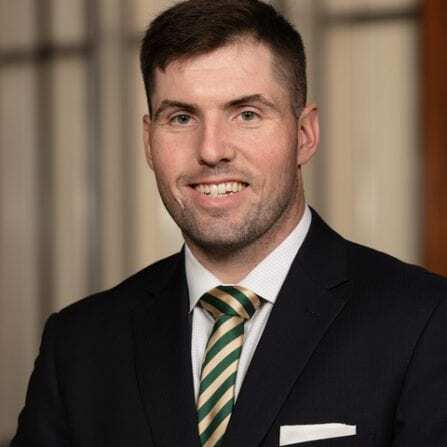 Upon completing his MBA from Notre Dame, RJ will be working for J.P. Morgan Chase as a senior associate in a leadership development program while additionally beginning classes for a Master of Science in Applied Analytics from Columbia University. RJ is a runner, reader, Star Wars super fan, and college football enthusiast.